27 + 50 x 36", 500hp @ 81rpm engine by Globe Iron Works (1887). 11 x 17' @ 115# steam, firebox boiler by Globe Iron works Co., Cleveland, OH. 1889, Jul 10 Launched; enrolled Cleveland; ran in iron ore & coal trades. 1894, Nov Holed in storm near Sault Ste. Marie, MI; repaired Superior, WI. 1895, Aug Ashore Gravel Island. 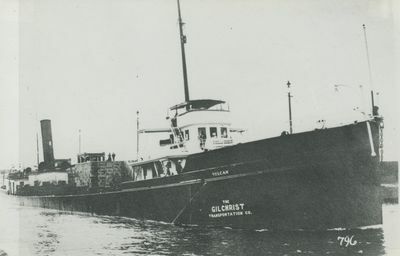 1902 Owned J.C. Gilchrist, Cleveland. 1903 Owned Gilchrist Transportation Co.
1906, Sep 30 Stranded middle ground near Port Huron, MI. 1909, Dec 11 Stranded Lansing Shoal. 1913 Owned R.C. & D.T. Helm, Duluth, MN, Atlas Steamship Co.
1917, May 7 Collision with steamer DANIEL J. MORRELL off Whitefish Point. 1918, Oct 30 Wrecked Point Abbaye, Lake Superior. 1919 Raised; rebuilt Collingwood, ONT; 243 x 38 x 21', 1,799 gross/ 1,024 net tons; renamed VINMOUNT; C138859; owned Montreal Transportation Co. & later that year Canada Steamship Lines, Ltd., Montreal, QUE.